A great twist to this popular fast-paced family game! To play this game, you need at least three players to participate. Each player needs to have a minimum of three chips (you can also substitute coins for chips). After determining which player starts the game, the first player rolls the three dice. 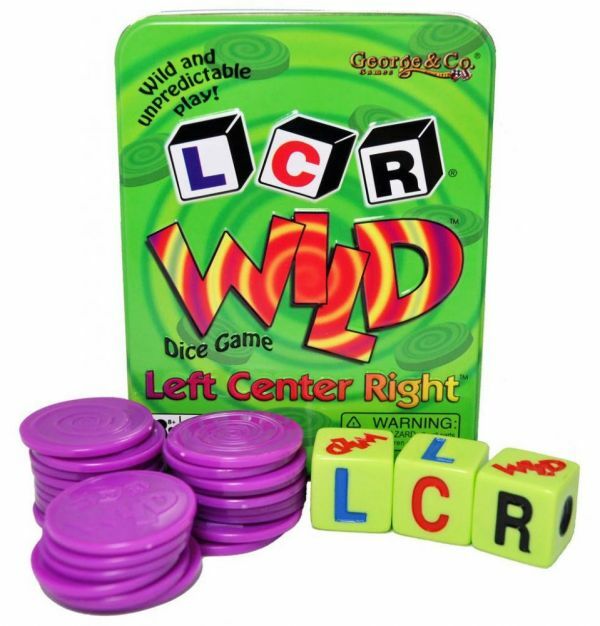 The number of L’s, C’s, R’s or DOTS rolled, dictate where the player’s chips go. The number of L’s rolled indicates the amount of chips to be passed to the player’s left. The number of R’s rolled indicates the amount of chips to be passed to the player’s right. The number of C’s rolled indicates the amount of chips to be placed into the centre pot. The DOTS are neutral and players neither pass their chips to another player or into the centre pot. If you roll one “Wild”: you’re allowed to take away one chip from anyone at the table. If you roll two “Wilds”: you’re allowed to take two chips away from one opponent or one chip away from two separate opponents. If you roll three “Wilds”: It’s very rare, but you get to take all the chips from the centre and the game resumes. The number of dice that a player rolls is indicated by the number of chips they hold. If a player has one chip, they roll one dice. If they have two chips, they roll two dice etc. If a player has no chips, they are still in the game, but they pass their dice to the next player. The game is won when there is one player left with chips, they do not roll the dice and they collect the centre pot.